Johnny Winter generated considerable goodwill as the driving force in Muddy Waters' Grammy-winning 1977 comeback album Hard Again, and after touring with Waters he recorded his own album, Nothin' But the Blues, using Waters' band. 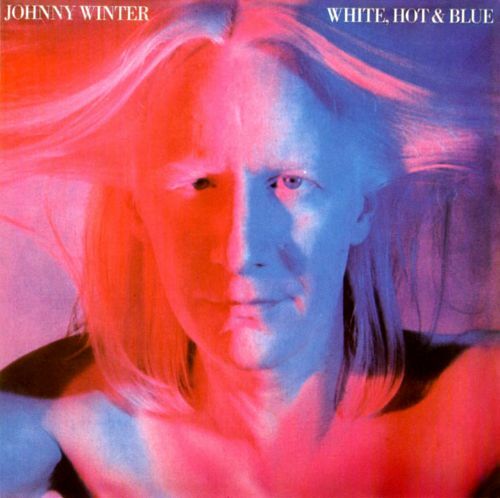 Winter began 1978 producing Waters' follow-up to Hard Again, I'm Ready, then again returned to the studio for his own project. On White, Hot & Blue, he is not leading Waters' band yet again, but he is still playing in a Waters-like Chicago blues mode for the most part. This time, the backup band consists of his old Texas compatriot I.P. Sweat on bass and Bobby (T) Torello on drums, although Pat Ramsey gets so much space for harmonica playing (replacing James Cotton, who was on Nothin' But the Blues) that he practically deserves co-billing on the LP. Winter is credited for three original songs, "Slidin' In," "One Step at a Time," and "Nickel Blues," but there isn't much original about them; they are standard blues tunes, with "Slidin' In" in 12-bar form, "One Step at a Time" in Chicago style, and "Nickel Blues" an acoustic folk-blues number. Maybe Winter wrote some new lyrics, but even those sound mostly familiar. No matter. The spirited playing heard on the Waters albums carries over here. Edgar Winter sits in on piano on "Nickel Blues," doing his best Pinetop Perkins. Taj Mahal's "E-Z Rider" is rendered as a Rolling Stones-style rocker, but otherwise this is a blues-filled album, and it retains the glow of a comeback that may have been designed for Muddy Waters, but has spilled over to Johnny Winter, too.